The surveying industry faces the same challenges as many other business segments: increased competition from Automated Valuation Models, the need for careful cost management, the need to improve employee efficiency, the desire to extend new and innovative product offerings into profitable markets, the requirement to keep clients satisfied and grow sales, and the opportunity to enable analytics to better manage the business. Now, mobile technologies allow “Real-time agent connectivity” that allow the valuer ‘on-the-ground’, the panel manager, and the lender to access and see data in real time. This has huge ramifications for the industry and the possibilities offered by mobile device platform use. 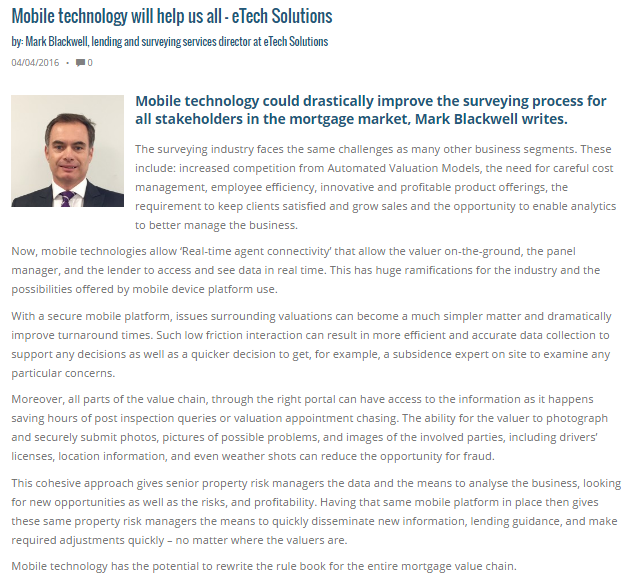 With a secure and reliable mobile platform from which to connect to their valuers, then issues surrounding valuations can become a much simpler matter and dramatically improve turn-around times. Such low friction interaction can result in more efficient and accurate data collection to support any decisions as well as, in the event of a problem, a quicker decision to get, for example, a subsidence expert on site to examine a particular concern. If valuers and brokers had a secure and reliable mobile platform from which to connect to instructions, their colleagues, or other company resources, these valuers and brokers can then increase personal productivity, collect accurate and complete information, and offer detailed personalized service to home buyers and lenders and reduce processing errors and delays. This cohesive approach gives senior property risk managers the data and the means to analyse the business, looking for new opportunities as well as the risks, and profitability. Having that same mobile platform in place then gives these same property risk managers the means to quickly disseminate new information, lending guidance, and make required adjustments quickly – no matter where the valuers are or what laptop, tablet, or smartphone device they prefer.